Over the past years, I think I’ve really learned how to use a computer to analyze games. Many times, the 3000+ rated engines suggest moves we don’t understand or aren’t capable of finding over the board. I played this game in the third round of the Northern Virginia Open last November. Playing with the white pieces, I played the move Ke3 and offered a draw. My FIDE Master opponent thought for about 10 minutes and then agreed. When I put the position into my computer (Shredder for Mac, a weaker engine – but still much better than me! ), it assessed the position as +1.04. I explored the analysis to find a potential break through, but the computer just told me play Ng4-f2 and wait for Black to play …e6-e5. I can slowly improve my position, but there is no distinct line that wins the game. While White is slightly better, I don’t think it’s fair to use the computer’s understanding of the endgame and say I should have won – as a knight v. bishop endgame is very difficult to win. I found the best example of a computer suggesting an instructive move during the Norway Chess 2015 tournament in the Carlsen–Aronian game just last week. Here Black holds a -0.82 advantage, but what does that mean? White has play in this position, as Carlsen threatens the move g2-g4. 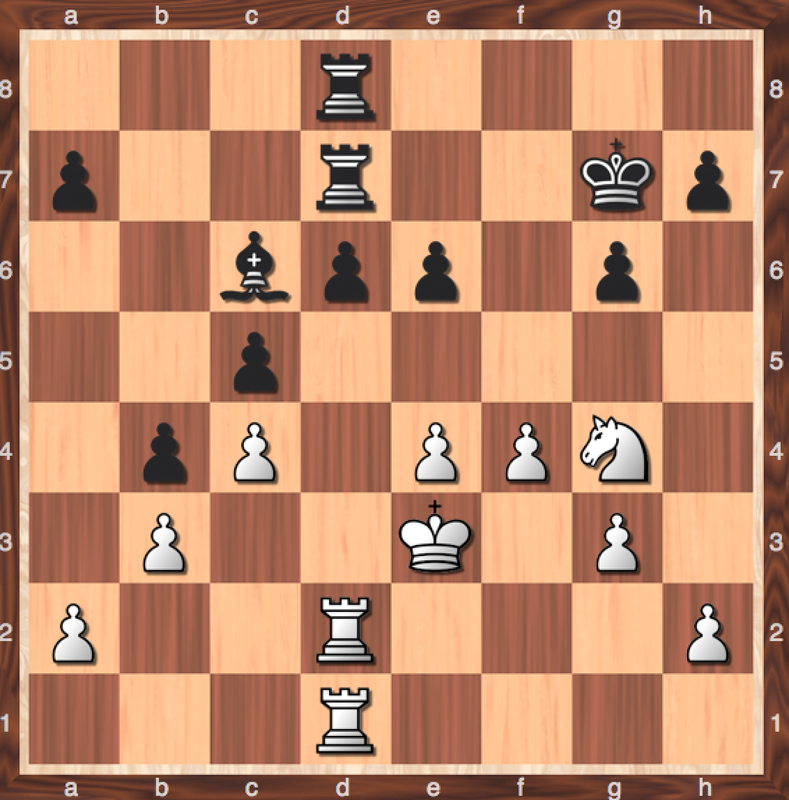 Aronian played the move 36…Qa1 but lost quickly after 37.g4 Qf1 38. Ne1!! as the rook is lost and all of the mating squares for Black are covered. So already, this position is worth looking at with a computer. We know with 36. Rc2, the black queen must move, but where? Common sense says …Qb4 (which is fine), trading the queens and moving into a risk-less endgame. What is the computer move? 36… Qb8! the only way to keep the advantage! The queen is on the same diagonal as the king, and if White gets greedy with 37. g4? then Black is winning – 37… Ng6 38. gxf5 exf5 -+ as now the queen must try to find squares that do not lose to a discovered check. 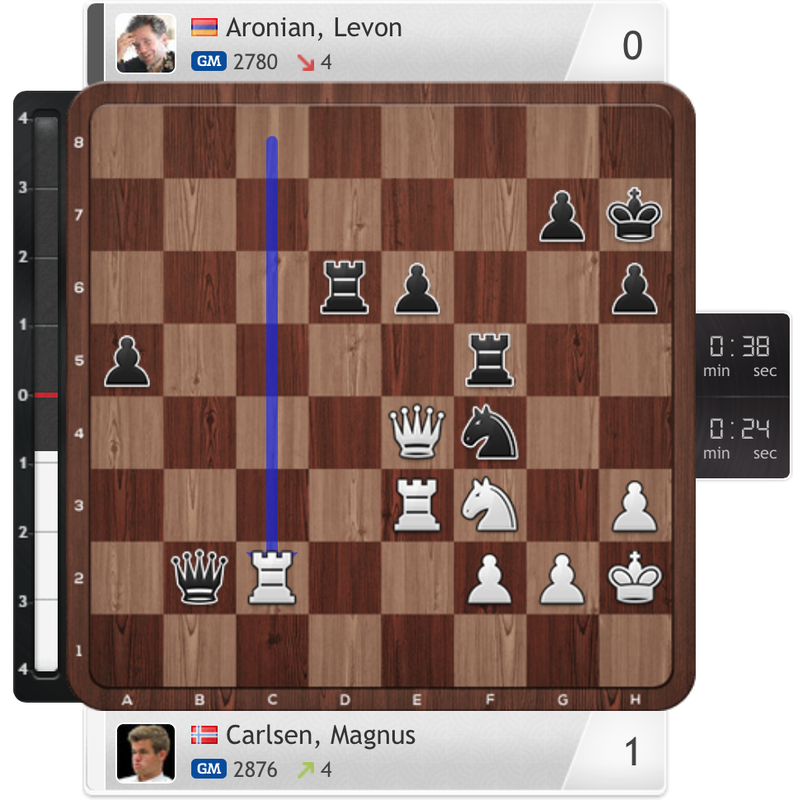 The takeaway from such a position, let’s say for Aronian, is not that he should have played 36… Qb8!, but a couple of different themes. 1) Full Board Awareness – The move 36… Qb8 is a very hard move to find (I only found it with help of an engine), but for a 2700+ rated player, it should not be unfathomable that Aronian could find it. Often times, players don’t like to retreat pieces in a position when they have the edge, but in this case, …Qb8 is the only active approach. 2) Playing Complicated Positions – I think for a ~2000 rated player, this position would be deemed equal if not for the …Qb8 move. Black is definitely on the attack, but it is unclear how Black would go about keeping the momentum while avoiding g2-g4 threats. From using the computer in the second position, we quickly saw that the computer move was actually quite constructive. While Black isn’t completely winning yet, it shows how rerouting pieces is a crucial idea. I feel like from using an engine in this game, I can say I learned something and became a better player. In my game, I think the assessment is correct, White is better. But at that time as a 1900 rated player, it is hard to see such obscure long-term ideas when playing a much higher rated player. I think looking back as a better player than I was in November, I should have played on – as the engine tells me here. But that’s it. The engine doesn’t give me the same constructive criticism as it did in the Aronian game. So what does this all mean? I think engines are helpful – they find tactics, stronger positional moves, and solid continuations. But at the same time, as a player thats not a GM/IM, its hard to hold yourself to a 3000+ rated standard on every move. Everyone makes mistakes, and while we are all trying to get better, I think its a much better use of time to use a computer only in positions where we make bad decisions. Spend the rest of your times studying tactics! Wow… this definitely colors the ongoing evolution of the relationship between humans and computers. Great post!